The image at left was posted a week ago today, Saturday, May 8. It is a forecast where tornadoes might occur (white line) and of the highest potential for strong tornadoes (hatched). 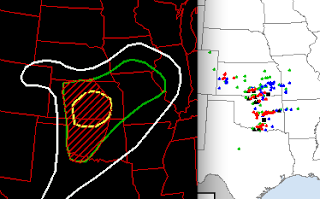 At right is a map with the red symbols indicating the location of tornadoes. While not perfect, it is a very good forecast -- more than 48 hours before the event. For two full days, meteorologists were warning of the potential for a major tornado outbreak. The goal being to raise awareness so that radio and television could be monitored for warnings if danger approached. The very low death toll (considering the number and intensity of the tornadoes) is testament to the effectiveness of this approach. wow were was this ?? ?